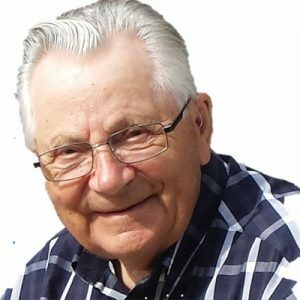 George was born on July 26, 1926 in Star City, Saskatchewan and passed away peacefully on April 10, 2019 in Kelowna BC at the age of 92. George was predeceased by his loving wife Pauline and loving companion Mary March, Parents Nicholas and Jennie, Ann, Audrey and Stan. George is survived by his sons: Garry (Melody), Lawrence (Zelda), Allan, Joseph (Susanne) and Kenneth, grandchildren: Ashli-lynn, Brennan, Candy, Tamara, Jared and Trent, great grandchildren: Alyssa, Kailynn, Reanna, Oscar, Ruby, Milla and Ander, great, great grandchildren: Reign and Ryver, brother: Harry, two sisters: Helen, Evelyn (Lorne). Condolences to all of the family. George was a very kind man. Fond memories of gatherings in Yellowknife. My thoughts are with you. So very saddened to hear of George’s passing. I will always remember him as a kind and caring man. May he rest in peace. Sorry to hear of the family’s loss. I never knew George but by all accounts he was a great guy. If his sons are any indication I know that to be true. Sorry to hear if the passing of your father. Thinking of you at this time. My sincere condolences to Joe and Sue and all the family. Sorry to hear that your dad passed Lawrence. Our thoughts our with you all. Our hearts go out to the Tkachuk family. George was such a nice man. Sorry to hear about George and sending all of the Tkachuk families my love. We are so saddened by your loss. May you memories help you in this time of sorrow. So sorry to hear of your dads passing. I’m glad to have had that little visit with him last summer, I will remember him as such a nice and kind gentleman! To Joe and all your family…just saw your dad’s obituary. ..please accept my condolences.